The Bicycle Superhighway Network in Copenhagen Capital Region. Orange: Built. Black: Planned and financed. Dotted: Planned but awaiting financing. The Capital Region of Denmark is continuing its investment in Supercykelstier - or Bicycle Super Highways. With five new routes completed on May 2, 2017, 115 kilometers have been added to the three initial routes. The goal is to make inter-municipality bike trips easier for the citizens of the region. The super highways are being developed on largely pre-existing cycle tracks. In the Capital Region, 60% of all trips less than 5 km are made by bike. This falls to 20% for trips more than 5 km. 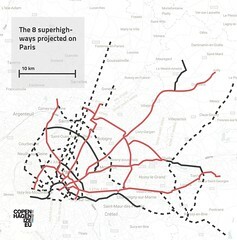 While the region is great for intermodality, connecting bikes with trains, the plans for the Bicycle Super Highway network target increasing the latter number through constructing 28 routes that connect and pass through 23 municipalities. These will give bicycle users newer, wider cycle tracks, better street surfaces, pre-green lights, in addition to better lighting and traffic calming measures where needed. This will create 3 million more bicycle trips a year, which has the potential to reduce the number of car trips by 720,000 a year. This will save the region 34,000 sick days and give a 7.3 billion DKK (€1 billion) economic gain per year. 206km of the network will be finished by 2018, out of 467 km in total. The first two routes, Farumruten and Albertslundruten, have experienced a growth in the number of bicycle users of 61% and 34%, respectively, since they were built in 2012. Those two routes, in addition to the third one, Ishøjruten built in 2016, are hub to tip routes connecting Copenhagen Municipality with surrounding municipalities. The new five routes help shape the network; adding not only more hub to tip routes (Allerødruten and Frederikssundruten), but also ring routes (Indre Ringrute connecting Sundby to Østerbro, and Ring 4 ruten from Albertslund to Lyngby-Taarbæk) and a route between outer municipalities (Værløseruten). 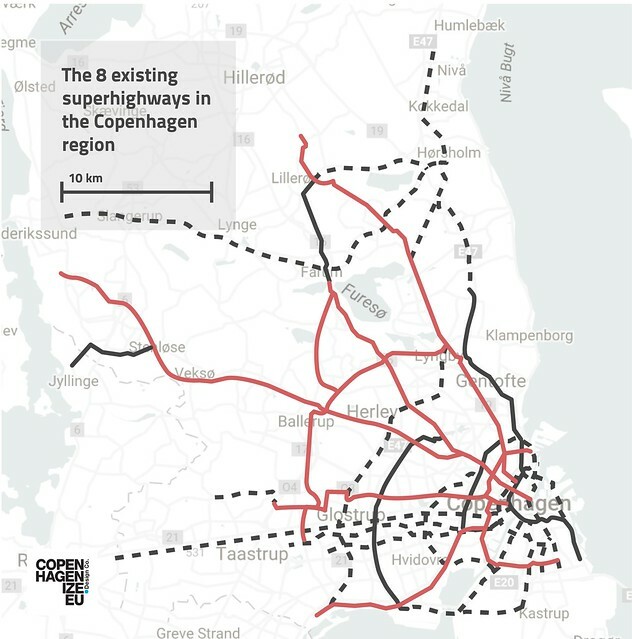 The five new Cycle Super Highways have cost 154 million DKK (€20.7 million), while the same road length for motorist highways would cost 17.71 billion DKK (€2.38 billion). Municipalities expect an increase of 1.5 - 2 million bicycle users with the new routes running. Copenhagenize Design Company's Idea Catalogue for all the municipalities in the Region, as commissioned by the Capital Region in 2014. 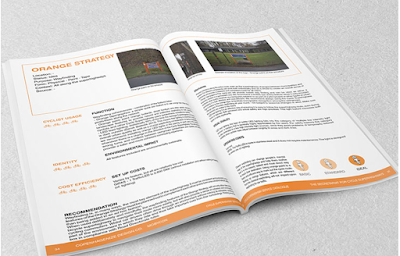 The project came with challenges on both regional and local scales. Funding the superhighways required a particular approach; normally municipalities are totally financially responsible for building their bicycle infrastructure, but some of the municipalities couldn’t afford building the superhighways or preferred to cut it from their budgets. This caused a threat that more municipalities would leave the project as its rationality depends on its continuity through all municipalities. The solution that overcome this, so far, has been a 50% state subsidy so that municipalities only have to cover 50% of the costs. However, challenges for this approach will rise again in the future as no municipal funding exists for the project after 2019. The experience of the two initial routes also highlighted responsibilities for the municipalities during the operation of the superhighways; the Gladesaxe and Furesø Municipalities - both on the Farumruten - improved lighting conditions, asking bicycle users what their favored type of lighting was. While the Allerød Municipality focused also on traffic calming measures; building a “2 minus 1” way on Bregnerød Skovvej, a road with one track for motorists and traffic in both directions. The municipalities have reached an agreement where each of them is responsible for running and maintaining its own part of the route(s) in close dialogue with the others. 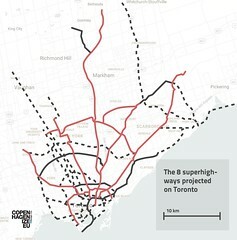 The success and rationality of a superhighway is achieved by the success of each of its individual parts in different municipalities, which raises the question of what form this superhighway will adapt to in rural, forested or urban areas along the way. It also highlights the importance of bringing all municipalities on board and keeping both the inter-municipality and citizen-government dialogues ongoing. In an attempt to convince some of the more sceptical mayors in the outlying municipalities, seven of them were invited to switch to the bike for their transport needs for one month. Their health was measured before and after and, based on existing cost-benefit models, the result was clear. On average they were 11 years younger, based on their improved health. 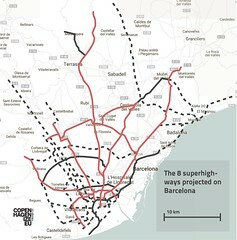 The Copenhagen Capital Region Bicycle Superhighway Network projected on Barcelona and London. This does not included the vast network of existing cycle tracks in the various municipalities, of which there are over 1000 km. 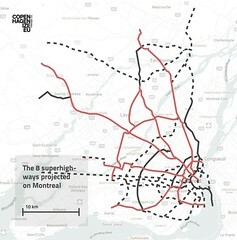 The Copenhagen Capital Region Bicycle Superhighway Network projected on Montreal.